Harlan grew up on the Upper West Side of Manhattan. Raised on classic rock 'n' roll, he was exposed to symphonic music, opera, and show music at an early age. He learned about world music as a teenager while traveling and performing in Senegal. He began composing in high school and majored in composition at the Berklee College of Music. He quickly fell in love with Bossa Nova. After leaving Berklee, he studied jazz guitar with Jimmy Ponder, worked doing transcriptions for Emile Charlap, and wrote jingles. He later took guitar lessons with Jack Wilkins, Peter Leitch, and Joshua Breakstone. For 6 years, Harlan performed and recorded with Sonido, the 12-piece Latin jazz & salsa group he co-founded with conguero Jeff Albert. He also performed with Elizabeth Meeker's 6-piece Latin combo, Dulcerito, and recorded the CD "Roots" with the Silas Meredith Band. 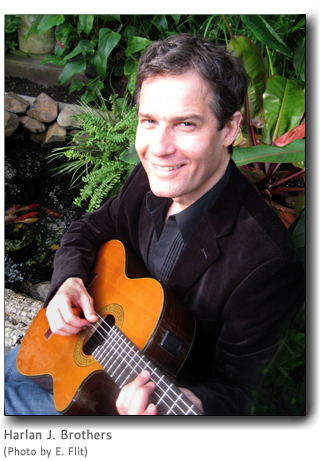 Harlan composes and arranges, and is well versed in many styles including jazz, rock, pop, dance, Brazilian, classical, and world music. He also composes different types of fractal music. Check-out this unusual and funky piece of fractal dance music called "Monkey Run." Skrillex, if your out there, this one's for you!